ST CROIX, USVI — A device that sat in the middle of the road on Friday morning near Joe’s Bar & Grill in the Sunny Isle Annex, causing a scare and mass confusion on St. Croix, was determined to be a dud by federal technicians, VIPD Commissioner Delroy Richards confirmed to The Consortium Friday afternoon. 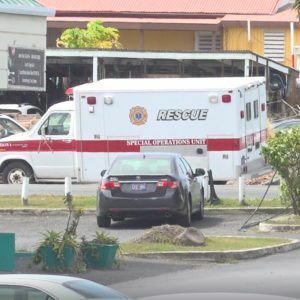 According to the commissioner, the device was made at the Youth With A Mission (YWAM) facility behind the Sunny Isle Annex, was stuck underneath a vehicle, and wound up in the middle of the road near Joe’s Bar & Grill. Mr. Richards also confirmed that a rumor making the rounds claiming that Scotia Bank was robbed, and that the device placed in the road only served as a distraction to facilitate the robbery, is false. Cherilyn Derusha, youth director at YWAM, confirmed to this publication that the device indeed came from the camp, and was made by camp staff as part of a game that is often played at the facility called “Behind Enemy Lines”, which is essentially Capture the Flag. Ms. Derusha apologized for the confusion in an official statement to be issued this afternoon. The device was first spotted by St. Croix resident Richard Dorsey, who immediately called police. Mr. Dorsey said he was driving heading east this morning when he saw a device in the middle of the road that bore the likeness of an explosive. “While driving I saw what looked like a bomb on the road. After turning around and confirming it, I called 911. It looked like all the devices you would see on the news, in video games and TV; it was very unsettling,” Mr. Dorsey said. Mr. Dorsey banded with other members of the community to divert traffic from the device until VIPD officers could arrive to the scene. “I’m thankful to God no one has been hurt and VIPD is handling the situation,” he said. Mr. Dorsey also explained what he saw: “There were two to three metallic quarter inch pipes with metal caps on them, with red or orange electrical wiring coming out of the caps. It’s wrapped in electrical tape with a black base at the bottom, with the wires coming from it,” he said.